Phuket has a large percentage of Chinese residents descended from those who emigrated from southern China a few centuries ago to work in the tin mine business as coolies. These people brought with them their rich culture and traditions and these influences are evident in the number of Chinese temples and shrines around the island and more markedly so in the yearly Vegetarian Festival. Their religion was and still is predominantly a mixture of Buddhism with a Chinese influence as well as Taoist gods. Red and yellow are the main colors used and animals such as dragons, lions and monkeys are also important symbols, seen around Chinese temples and shrines. The Bang Neow Shrine (also spelled Bang Niew), known also as Tao Buang Keng and Thep Rasi Foundation Shrine, is a beautiful place of worship in Phuket Town. Founded in 1904, it was originally part of another shrine at Soi Romanee in the Old Town. It has moved a few times – strangely enough always because of fire. If looking in from the road, you’ll notice that the shrine is unusually long and has many doors. This is because it houses many shrines (almost 10 of them) that lie immediately next to each other. The most important shrine is the one in the middle, where the main deity is. The shrine has an elegant interior design with many lovely color printings on the walls recounting stories from Chinese literature. The dragon, an important Chinese legendary creature, is represented well here as you will see them everywhere not only in the paintings but beautifully carved and lifelike on the shrine’s supporting columns. The smaller unit on the left side of the main building is used as an administration office but is conveniently turned into a vegetarian kitchen and canteen during the Vegetarian Festival. Location: On Phuket Road at the Bang Neow intersection and not far from Robinson Department Store and MacDonalds. If heading to Saphan Hin Park, the shrine is on the left-hand side of the road. 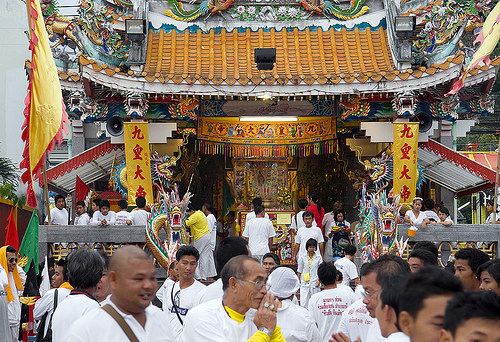 Jui Tui is a popular Chinese temple that plays a pivotal part in the annual Phuket Vegetarian Festival. Located not far from Phuket’s main market, it’s a must-see site. Located on Soi Phuthorn, Ranong Road, not far from Phuket’s main market, it’s a must-see site for all newcomers to Phuket as one of the oldest and the most respected spiritual centers around. Jui Tui Temple was previously located in Soi Romanee in Phuket Old Town and was moved to its current location after a fire many years ago. The grounds are quite impressive and display photos of the temple dating back to 1911 when it was just a single, stand-alone construction without side buildings or walls. Jui Tui Shrine main building itself has been through a number of renovations, resulting in an attractive exterior and interior with three large altars featuring statues of Chinese gods. Its principal deity is Tean Hu Huan Soy, the god associated with performing artists and dancers (The Chinese opera regards him as their patron). His image is set in the middle and at the highest position on the main altar, accompanied by a statue of a dog and a chicken to each side. They are said to have been his favourite pets since childhood. Photography is allowed inside the hall. On the left-hand side of Jui Tui Shrine’s main building (when facing the street) stands an attractive ‘firecracker house’ that was completed in 2011. It’s a tiny red building with a double-tiered roof and four slim columns that have dragons around them and it’s where burning firecrackers are thrown, thus reducing noise and air pollution. For visitors who have never experienced fortune sticks or who want to know what the future will bring them, here is a chance to learn more. Shake the bamboo cup holding the fortune sticks. Stop when one stick has dropped to the ground (repeat if more than one stick falls out.) Each stick has a designated number and you should fetch the matching fortune paper available at the nearby red cabinet. It’s free of charge. The papers are written in Thai and Chinese only. Why is the Jui Tui Temple so important for many islanders? Basically, it’s the place where they can come to celebrate (birthdays, weddings, newborn babies and healing, you name it!) as well as to share their sorrows and hard times in life. Tean Hu Huan Soy is very much counted as a senior family member by locals, especially those who live in neighbouring communities and has a special place in their hearts. It’s common for Phuket students who are going away to pursue a higher education to visit the shrine and invite the deity to go along with them to their new location. Also, there is a small area inside Jui Tui Shrine devoted to those who participated with its works and activities over the years. After they pass away, their names are posted here and their family can come and pay respect to them. Some have family members listed for up to three generations and that says a lot about the strong connections between this old temple and the local community. Kathu Shrine has shared a long history with Phuket’s Vegetarian Festival and is known as the original home of the festival. Rumor has it that a Chinese opera from mainland China came to town and for no particular reasons, members of this group started to fall ill. After a while they realized that they had forgotten to carry on with their important traditional vegetarian diet. Finally, they held a vegetarian diet ceremony at their temporary opera house at Kathu and within no time all the sickness and problems amazingly disappeared. Locals couldn’t believe their eyes when witnessing what had happened. They too participated in the ceremony and have been carrying it on until today. This is the roots of the great annual Vegetarian Festival that Phuket is known for. The original Kathu shrine was very small and not at all grand. Over the years, a lot of work and effort was expanded to renovate its condition and nowadays this shrine is considered by many islanders as the most holy of all in Phuket. Traditional materials and techniques were used and the restoration was done following traditional Chinese architecture as visitors can see, starting from its main entrance. The shrine also houses some impressive and historical items including wooden crafted Taoist deities in lively poses and a variety of vintage implements once used for body piercing by spirit medium (aka ‘mah song’ in Thai) during the festival many years back. Guests are welcome to visit the shrine as long as they don’t disturb a private hall, home of a deity that is named as the ‘chairman’ of the festival. It’s a small chamber that has beautiful decorative yellow curtains drawn at all times and with a big sign (in Chinese) above its entrance. You’ll know when you see it. Not even the Kathu villagers know what it looks like inside as only a few chosen people are allowed to enter, so don’t feel bad about it! Kiew Tien Keng Shrine is stunning and is located in Saphanhin Park and is one of the most beautiful places of worship in Phuket. It’s the only shrine that is located near the seashore and is considered the departure spot to send all gods/deities back to heaven on the final night of the Vegetarian Festival. It’s where the colorful parades of each of the other shrines officially end when the festival is finished and a normal diet can resume. There are artistic images of various deities on the altars and quite a few life-size statues here and there. Among them is a silver statue of Ji Gong who probably is the most non-traditional monk in all Chinese folklore. Not only did he eat meat and drank, his image was also projected as a smiling monk who wore nothing but beggar-like clothes and always holding a torn bamboo hand fan as well as carrying funny stuff with him (the one presented here has a chicken on one knee, you can’t miss it.) Legend has it that he was a talented medicine man with a big heart therefore he was a hero for the poor. Also, there are the impressive eight immortals of the Taoist tradition standing tall on the terrace looking out to sea. Overall, the quality of the workmanship and choices of materials chosen here are quite amazing. Truly a must-see shrine and it is open daily! Nobody knows exactly when the Samkong shrine was built. All that is known is that a well-to-do family donated a plot of land together with images of some Taoist deities to start it off. Since then the shrine has been a major part of Samkong villagers’ lives especially when someone fell ill or needed some advice to improve their health. The only way for folks to communicate with the deity was through a spirit medium but the medium too was having a hard time and could not understand anything at first. According to locals, this very particular deity once was a human who worked in the Chinese Imperial Palace therefore he used the regal terms that were used in the palace. But then things worked out for the good once the deity switched to Hokkian, a dialect that was better known. Nowadays, many people still come here to pray for good health. Some of them bring along traditional medicine from local shops and pray for the deity to bless it before using. Visiting the shrine is free; however donations supporting shrine renovations and charities are appreciated. If you go in or out of town using Thepkrasattri Road you will notice an elegant Taoist Shrine. This is Tha Rua Shrine, the fourth-oldest on the island. Once a tiny shrine it has now relocated to a much bigger plot of land right near the original site and features many striking carved dragons, traditional Chinese paintings plus an outstanding red-gold-and-green color theme. In the centre of the front terrace stands a huge brass container with dragon motifs. This container, brought all the way from China, is used for incense burning. Inside the hall you’ll find Kwan Yin statues (the Goddess of Mercy) of various sizes as well as traditional Taoist deities. This shrine complex consists of the shrine itself as its centre point, a spacious car park and in the future it will have a large kitchen, a garden and more. The Tha Rua Shrine is no doubt the largest and probably the best-looking shrine in Phuket. So far the restoration project has cost about 40 million baht since the start in 2002 and is funded purely by donations. If it is possible, avoid wearing black clothes when visiting any Chinese shrine/temple in Phuket. While white is the most auspicious color, any color other than black will do. This is a great place to take photos. Opening Hours: Daily 06:00 – 18:00. Opening hours are extended on special days including during the popular Phuket Vegetarian Festival when the shrine opens its gates 24 hours a day.